Carmona has always been a strategic site. Phoenicians, Carthaginians, Romans, Visigoths, Arabs, Jews, and Christians have each left a layer of history. Three fortresses were once attached to the town’s original Roman walls. One of them—the highest and most easily defended—is today's parador. The fortress took on its present appearance during the Moorish occupation and was later embellished under King Pedro the Cruel, using the same craftsmen who built the Alcázar in Sevilla. Pedro the Cruel used the castle primarily as a love nest for an affair with María de Padilla. Meanwhile, he had locked up his own bride of two days, Blanca, daughter of the duke of Bourbon, in the alcázar of Toledo and later at the castle of Sigüenza, where she was executed eight years later. Pedro’s brother later killed him with a dagger. In the late 15th century, Ferdinand and Isabella took up temporary residence in the castle before their final siege of Granada. Carmona is about 25 minutes by car from Sevilla. Staying here may be an option for those who don’t want to deal with the traffic and parking of the city. Buses to and from Sevilla leave every hour. Some of the paradors in Spain can have problems with acoustics and soundproofing, and the Parador de Carmona is one of those. The best rooms are on the top floor; these have private balconies. Carmona is 30 km east of Sevilla, off the National IVhighway. Buses leave every hour. The parador is well signposted. 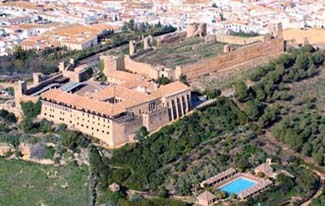 The Parador de Carmona sits along the ancient wall of the southeast side of the city of the same name. Its wonderful views look out over miles of plains dotted with small farms. The reconstruction of the main palace took six years to complete. The inside Moorish courtyard has a fountain in the middle of a garden, Mudéjar brick archways, columns, and blue tile work. Windows are covered with lattice-work screens. Spacious guest rooms are painted in muted shades of whate and gray, with white Moorish tiles embellishing the walls. Throw rugs cover large-tiled floors and furnishings include big comfy chairs. Many rooms feature four-poster beds and wooden doors that open out onto a balcony. The dining room is now in the former refectory, a charming room with high vaulted ceilings, wooden beams, and tall windows that look out over the valley.